Jake and Eva face many obstacles in their quest for a fresh start in the community, but perhaps with God's help, they can find the redemption they both desperately seek. My thoughts: STARTING FROM SCRATCH is a great new Amish romance from acclaimed author Kate Lloyd. Written in first person, you are in Eva's head and privy to only her thoughts and opinions, which leaves the reader guessing. Will Eva find someone to love? Jake is back, but rumors abound that he'd married another. Has he? What about Mark, a younger Amish guy five years Eva's junior who seems smitten with her? Or Stephen, a Mennonite man who seems interested? Or the widowed bishop? A love dilemma with many angles and I was left guessing, forming opinions and changing my mind as I got to know each character. I felt for Eva forced out of her home by her brother's wife and hired at a job she really wasn't prepared for. Manager of a restaurant when she could barely cook and didn't read a recipe all the way through before starting? God must have been laughing at that. Add in a rather grumpy Italian widow who disapproves of everything Eva ever does and judges her on her past, an Amish teen with a major crush on one of Eva's prospective beaus and thunderstorms galore (God's judgement on Eva?) and you have a page-turner sure to hold you captive from start to finish. Kate Lloyd expertly wrote a character who his vulnerable and hurting, one I couldn't help but root for. I was given a copy free, all opinions are my own. 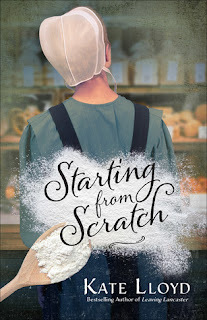 Starting from Scratch is on my TBR list. I'm trusting our library inter-loan service will have it soon. A great review and I'm looking forward to reading Kate Lloyd's latest books.